What Is Your Favorite Window? Let’s imagine windows as large eyeglasses; they expand our perception. Windows are metaphors for vision. When we pay attention to how we see, we gain depth of vision, and improve our view. Do We Have Small or Large Windows? Too many small windows, and we might feel like we’re on a ship looking through round submarine portholes. These windows are too narrow to allow for insight, and leave us feeling cramped. Solution: Create more internal space. Engage in spiritual study. Too many large windows, and we’ll feel energy rushing in, bombarding our senses. Solution: Set boundaries and limits. Let’s choose what we focus on. Windows that have screens help us with discernment; they ‘screen’ what to let in and what to leave out. Screens serve as protective filters. The key is a balanced view, where everything seems in right proportion. It’s important not to gorge our senses, and yet not deprive them either. Beauty and nature have a lot to teach us. Observe the symmetry, the balanced view, in a Japanese garden, a mountain meadow, or a tree with birds among its branches. How Much Light Do We Let In? Do our windows open and close? Do our windows have thick or light window coverings? A shut window blocks light, air — life. When we open our windows and let the light in — we open — and what was closed off starts moving again. 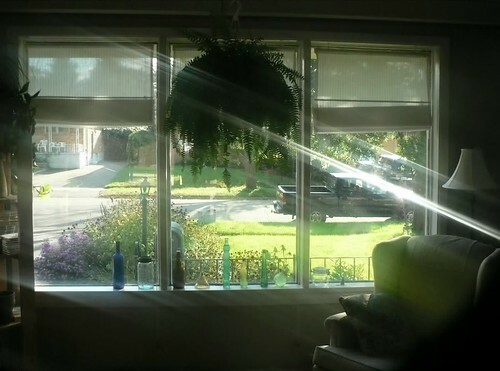 Letting light in through our windows increases our joy, laughter, and wisdom. Our soul stretches, and we attract synchronicity and flow. Crack open a stuck window, and we’ll feel the breeze on our skin, and the breeze says, “Wake up!” Our breathing shifts, and we relax. Letting air in through our windows strengthens our ability to communicate, enhances circulation, opens the breathing passages, and invites magic and whimsy. There is an interactive relationship between the observer and the observed. Energy is exchanged, and there is a potential for healing. When we watch a sunset radiate through our dining room windows, we feel its pastel orange rays touch our shoulders. We give the sunset our attention and energy, and the sunset bathes us in warmth and enthusiasm. When we watch the stars flicker in the sky through our open windows, we connect with the stars and the wisdom of the night sky. The stars talk music and philosophy; they inspire us. What are your favorite windows? How does the view speak to you? ← How Do We Recognize A Sign?